Gymnastics of San Antonio challenges children of all skill levels with programs that are developmentally appropriate. Your child will grow physically, emotionally and socially with every new skill learned! 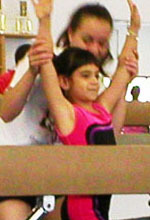 Gymnatics of San Antonio uses a progressive curriculum that is modeled after the USA Gymnastics Junior Olympic Program. This system consists of three skill levels that allow for the accommodation and success of every child, no matter what his/her physical abilities may be. The 60 minute recreational classes are grouped according to gender and skill level. Four different genres are offered: Girls/Boys Gymnastics, Trampoline and Tumbling, Acrobatic Gymnastics and Cheer Tumbling. Our staff will give your student time to work on the basic skills first so that he/she can build a strong physical and emotional foundation that will allow him/her to more easily learn the intermediate and advanced skills. Boys are taught gymnastics skills on all the men's apparatus: floor, parallel bars, high bar, pommel horse, vault and trampoline. Girls are taught gymnastics skills on all the women's apparatus: uneven bars, beam, vault, floor and trampoline. 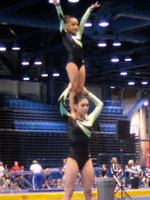 Classes teach proper tumbling and jump technique for cheerleading. Gymnastics of San Antonio uses a Straight Body Technique that makes tumbling easy! Our low student coach ratio of 8:1 is unheard of in the industry! This program is excellent for students interested in preparing for cheerleading, improving skills for cheerleading or for those who are getting ready for tryouts. Classes concentrate on gymnastics skills needed for the tumbling floor, trampoline, and double-mini trampoline. Students will learn to demonstrate speed, strength and skill while executing a series of acrobatic maneuvers on the tumbling floor, trampoline and double-mini trampoline. Many students use their learned skills for cheerleading and springboard diving. Classes combine the beauty of dance, the excitement of gymnastics skills and and the synchronization of pairs figure skating. Friendship, trust and communication skills are developed as students work with a partner/partners to build intricate pyramids while showing various acrobatic and gymnastics skills. Advanced students will perform choreographed routines consistening of dance, tumbling and partner skills such as handstands and tosses of the top partner. Our adult open workout is for new or former gymnast who want to learn or improve their gymnastics skills with other students their age. A coach is available to give guidance or a spot. The class is offered later in the evening to provide a quiet and comfortable learning environment. Our team program is designed for students who have mastered our recreational level skills and are ready for the challenge of competition. We currently offer a Girl's Gymnastics, Tumbling and Trampoline, and Acrobatic Gymnastics teams. Each team competes under the USA Gymnastics Junior Olympic Program.